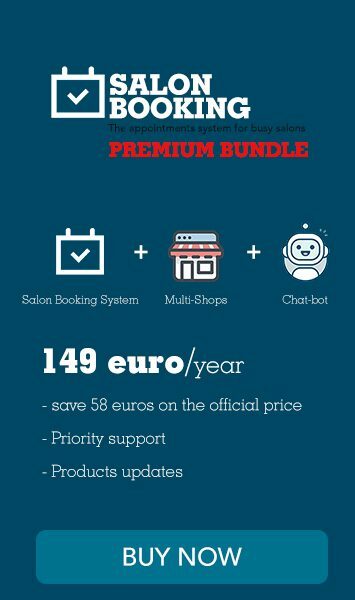 It can happen that you need to use a different wording on Salon Booking plugin, in this guide I’ll show you the possible solutions. For those of you that are using a language different from English I suggest you to install a plugin like “LocoTranslate”. Click on “LocoTranslate > Plugins > Salon Booking System”. Then select your current language and then click on “Synch” button, then on “Save”. Now you can search for those text strings you need to change and edit the current translation according to your needs. Once finished click on “Save” button. Our plugin default language is “English US” so you need to set your WordPress language to “English UK”. Install a plugin like “LocoTranslate”. Click on “LocoTranslate > Plugins > Salon Booking System > Languages > English UK”. Click on “Synch” button, then on “Save”. Now you can search for those text strings you need to change adding your favourite English version of the desired string. Whatever is your case make sure that your changes are saved in a safe place to prevent to be deleted on the plugin update. How to update your own translations when a new version of Salon Booking is released?